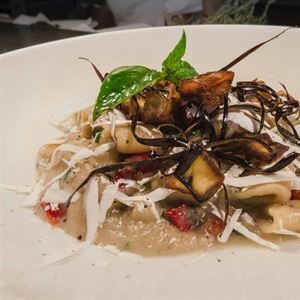 Set along the shaded street of Civic Boulevard in the coastal town of Rockingham, is a little taste of Italy, Andiamo Cucina Italiana. Be transported abroad as you enter a modern interior of crisp table linens, splashes of red and bi folding doors opening onto a spacious alfresco dining area, creating a space inspired by the streets of Italy. Andiamo is a multi-award winning restaurant, offering authentic yet refined Italian fare. Begin your culinary journey with an entrée of Scampi – grilled deep sea baby Langoustine in a Chardonnay, tomato and herb sauce. For the main affair, opt for a plate of soft housemade gnocchi with bacon, Parmesan and Salsa Al Pomodoro or perhaps the Ravioli Al Sugo – ricotta ravioli with pine nuts and spinach washed down with a glass of Penfolds red. We dined at Andiamo with friends from Perth and we chose the set menu, which I didn’t expect to be as good due to the lower price. However, we were all delighted with the food options chosen. The owner of Andiamo was warm and friendly, speaking about where he had been raised in Italy and the food was authentic and tasty. There was a good choice of wine and nothing could be faulted. I cannot wait to return again to try some of the other menu choices.